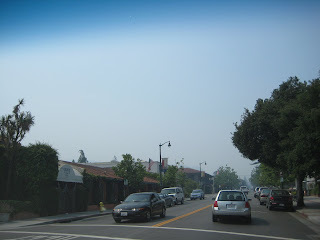 This is the view down the main street - normally you can see the hills, and even the end of the road - what you can see is the smoke from the fire in the Santa Cruz mountains. 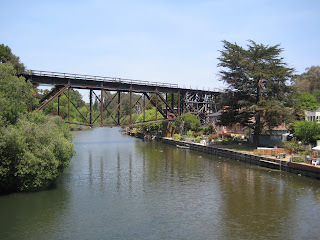 Capitola of course. 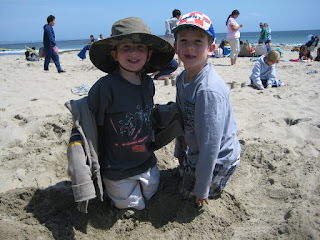 We had a great few days by the sea. As well as beachcombing (too cold to swim) we also took our bikes so Finlay got a lot of practise on his new mountain bike. Finlay has moved to a 'big boy's bike'. 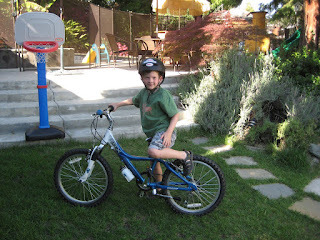 Now he is riding more often he needed to trade up from the Spiderman bike and is now the proud owner of a mountain bike. He also brought home his first real original writing assignment. 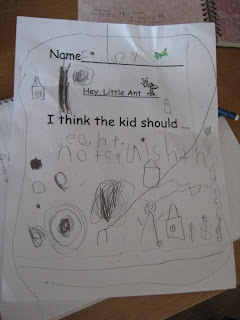 It reads "I think the kid should...not squish the ant" (my translation. You can sort of read it with 'ant' on the line above). 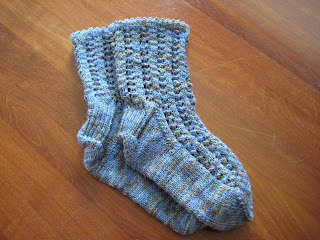 These are Karen Baumer's Simply lovely lace socks from the Spring 2006 Interweave Knits. The pattern worked really well and fits me perfectly. Knitted in Seawool from Creatively Dyed that I bought at Stitches 2008. I used 2mm dpns. The yarn is a blend of 70% superwash merino and 30% seacell (a tencel-like fibre based on seaweed). The yarn was lovely to knit with and has a nice soft hand. I had meant to do a star toe on these - but found myself decreasing for the toe while we were away so I stuck with my regular toe. I think the star would have looked prettier with this pattern. Finlay's former speech therapist is about to have a baby. She knows that it's a girl so pink socks were in order. 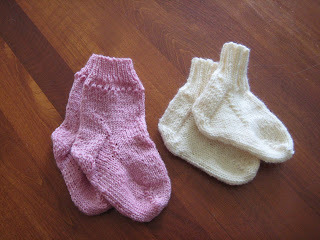 These socks both knitted from leftovers of superwash wool. It's finally cooling down here in the Bay Area. 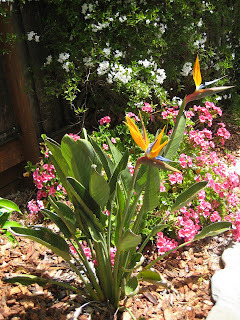 We measured a high of 110 degrees in the back garden (in the shade). 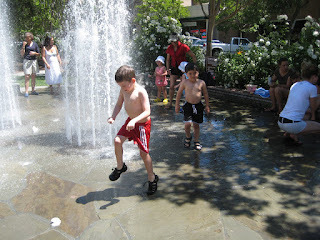 Finlay found an excellent opportunity to cool off in the fountains in the town plaza after soccer! I am back from an impromptu blog break. I spent last week in LA and didnt take the camera (or indeed have much to report). We planted them 3 years ago and this is the first year they have bloomed. They look wonderful: just as if some exotic bird has alighted at the side of the pool.